The death of a loved one is never going to be something that’s easy to deal with but when their life has been taken in a fatal accident or due to somebody else’s negligence. In either of these cases, there is a high probability that a compensation claim could be made by either a dependent of the deceased, a family member or the estate of the victim. In any of these cases Advice.co.uk can help to make a fatal accident compensation claim with you. If you’d like to begin a claim today, please contact us on 0161 696 9685 so that one of our personal injury specialists can help you to begin a claim. If you’d like to know more information first then please carry on reading this guide which will provide all the information that you may require prior to beginning your claim. What Is A Wrongful Death Or A Fatal Accident You Could Claim For? How Much Can I Claim For A Wrongful Death Or Fatal Accident? What Can My Fatal Accident Or Wrongful Death Claim Include? What Else Can You Be Compensated For After A Fatal Accident Or Wrongful Death? Who Is Eligible To Make A Wrongful Death Compensation Claim? Can I Make A Bereavement Award Claim? The devastation of losing a loved one in a fatal accident or case of wrongful death is always going to be massive. With no time to prepare for the death and little time to adjust to the new circumstances following the death, there is going to a huge impact on the family and friends of the victim. Of course, wrongful death compensation isn’t going to be the first thing on your mind following the death but at some point, as you begin to come to terms with everything that the death has caused, you may want to consider beginning a claim, especially if the victim was the main earner in the family. Advice.co.uk are personal injury specialists who are able to help you to begin a claim using a solicitor who’ll work on a no win no fee basis to make the claim a little bit less stressful for you. This guide sets out to explain the definition of wrongful and fatal deaths, the accidents which commonly cause them, who can make claim, how much compensation can be claimed and what you can include in fatality claims. We understand that making a claim is going to be a difficult process for you to go through so we won’t put any pressure on you and will always try to work at your pace at all times during the claim. We want to ensure that you receive the correct amount of compensation to enable you to cope a little better going forward. You can base this on the similar section in the Legal Expert guide article. Make sure to include all the information. A fatal accident is one where the victim is killed in an accident caused by a third party, with no fault on the part of the victim but where it is possible the 3rd party may not be to blame in all instances. This could be a road traffic accident, a criminal act against the victim or accidents in the workplace. Wrongful deaths are slightly easier to define as they are caused by the negligence of another person and, again, there is no fault from the victim. Examples of wrongful death include death during an operation or surgical procedure (medical negligence) or death in a workplace where the machinery or equipment did not conform to regulations. The difference is slight but in fatal accidents, it’s not always clear who is to blame for the accident whereas wrongful death it is much more clear that somebody is at fault for the fatality. You may have read about fatal accident compensation calculators on other sites but, in reality, the only way to get an accurate estimate is to speak with personal injury specialists who can assess your claim fully, which a calculator can’t do. Every case is different and the impact on the claimant is unique in every case. Whilst we can’t provide a compensation calculator, we can show the table below which outlines some of the compensation awarded for General Damages (see the next section for more information). This is just one part of the claim and more parts may be included as well. As you can see, there can be a lot of variance between cases, so to get a better estimate of what you may be able to claim, please call one of our team. This element is for the pain and suffering part of a claim. It is not for the pain suffered during the accident but the pain and suffering that the death has caused the claimant. These are damages that may be awarded to the claimant by the way of punishment to the 3rd party who caused the accident (this is on top of the normal general damages). Funerals are not cheap, and, in the case of fatal accident compensation claims, they are completely unexpected costs which you may try to claim back following the accident. We cover this in more detail in its own section later in this guide. Emotional pain and mental anguish that is encountered by the claimant and the adverse effect on their day to day life. Future lost earnings can also be claimed based on what the victim contributed towards the family income. Loss of benefits can be claimed if any have stopped because of the death and the claimant would’ve benefited from them prior to the accident. Long-term adverse effects that the accident has caused for the claimant such as loss of protection, loss of care and lost future inheritance. As you can see, these types of claims have a lot of complex elements which need to be proven before they are paid out which is why we recommend you use a personal injury specialist like Advice.co.uk when making a claim as we understand all of the supporting legislation and only use specialist personal injury solicitors to make the claim. There is special legislation supporting fatal accident compensation claims, namely the Fatal Accident Act 1976, which details who may seek compensation following a fatality that was caused by somebody else. Essentially it states that if a death is caused by any negligent reason where the victim would’ve been able to make a compensation claim themselves, had they not died, then the person responsible can still be liable for damages claimed by relatives of the victim (see below for the eligible list). A partner who has been co-habiting with the victim (effectively as their husband or wife) for over 2 years before the death. Other relatives including siblings, cousins, uncles, aunts, nephews and nieces. If you’re in any doubt about whether you’re eligible to make a claim, please get in touch and we’ll assess your claim with you. A bereavement award is separate to the compensation claimed for as described above. It is a statutory among of £12,980 and is payable by the 3rd party who caused the death regardless of whether there was any financial impact on the claimant. Unlike the Fatal Accident Act, bereavement awards are only payable to the spouse of the victim or to parents of a child involved in a fatal accident. Over the next few sections, we’re going to cover the most common fatal accidents that lead to compensation claims. We understand that other accidents happen, so don’t worry if the accident you want to claim for isn’t listed as we can help with any claim, so long as there was somebody else responsible. Road traffic accidents happen every day in the UK but, in the most serious cases, they can lead to fatalities of one or more people in the car, pedestrians or cyclists. Obviously, because of a fatality, the police will investigate the accident but as with any road traffic accident, ensure that you obtain as many contact details from the other driver as possible. If the other driver caused the accident, then a fatal accident compensation claim can be made by the people listed in the previous section. Not every accident at work would be eligible for a compensation payment but cases where it can be clearly proven that a colleague or the employer were negligent in some way would be eligible. No, or inappropriate, personal protective equipment (PPE) was provided when the accident occurred. Staff were not trained properly or made aware of the risks involved. Machinery or tools were damaged, faulty or poorly maintained. If risk assessments had not been conducted prior to the task being undertaken. Work vehicle accidents where a passenger, driver or bystander are fatally wounded. Slips or trips that result in a fatality. Health and safety investigations and coroners reports should identify how the fatal accident occurred but if you are in any doubt or suspect the employer was negligent then please contact one of our team to discuss your options. Wrongful death compensation claims due to medical negligence can be complex cases to prove which will usually require specialist medical advice to support the claim. Other examples of medical negligence exist so please get in touch if you believe you have a valid claim for wrongful death compensation due to medical negligence. 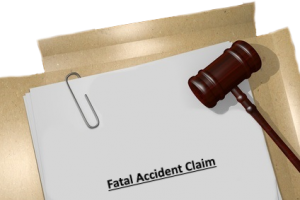 As with other claims for fatal accident compensation, if the local authority or council caused the accident in some way, then you would be entitled to claim against them as well. For the council to be held responsible, it would have to be proven that the cause of the accident was something which they should’ve been aware of or taken steps to prevent it from causing an accident. An accident in a council run park or community area which was caused by damaged equipment. To prove the council liable may be difficult but a coroner’s report may already indicate that they were to blame. To check if your claim is valid, then please contact one of our advisers today. All personal injury claims in the UK are subject to strict time limits which means you must submit your claim on time otherwise it will be automatically rejected. We recommend that you contact us as soon as you feel able to, following the death of your loved one, so that the solicitor we connect you with has enough time to put together a thorough case and to gather all of the supporting evidence that is required. To begin your claim, the first step is to call us and discuss what happened and how it has affected you. We know that it will be difficult for you to recall of the details surrounding the death of your loved one all over again, so we’ll work at your pace to ensure you don’t feel pressured at any point. We offer free legal advice, so even if you’re not sure if you want to begin a claim yet or have concerns about how the claim works, you should still get in touch so we can point you in the right direction. We’ll ascertain the key parts of what happened including who was fatally injured, where the accident happened, where it happened, who you believe caused the accident and then we’ll ascertain whether you’re an eligible person to be making the claim. Once we’ve gathered all of the information, we’ll assess everything thoroughly and advise you if you have a valid claim for compensation or not. We don’t want to mislead you at this traumatic time so will always assess claims honestly and let you know what we think you should do next. If we agree with your claims, and you’re happy to continue, we’ll connect you with a personal injury solicitor who will work with you on a no win no fee basis. Following the death of a loved one, the last thing you’ll want is a large legal bill for making a compensation claim. This is why we only work with solicitors who offer a no win no fee service. When you sign a Conditional Fee Agreement (CFA – or no win no fee agreement), it will specify a ‘Success Fee’ which is a percentage of any compensation that will be given to the solicitor if they win the case (it is limited to a maximum of 25%). If they lose the case, you don’t pay them anything at all for their service, but if they win the compensation for you then they retain their success fee and then send the rest of the compensation straight to you. Other alternatives to no win no fee include agreements where you pay the solicitor for their service and time yourself and you keep 100% of any compensation they win but, if they lose the case, you still have to pay their fees (which can mount up to large amounts in wrongful death compensation claims). We only work with no win no fee claims as we believe it is the most risk-free and stress-free way to make a claim. Our team are specially trained in helping with personal injury claims and understand what information is, and isn’t, required when assessing a claim – so they won’t waste your time with pointless questions. We understand how difficult a time it must be when making a compensation claim following the death of a family member so will always work at a pace that is comfortable to you and in a friendly but professional manner. Our team are dedicated to getting you the correct amount of compensation for you and will work tirelessly to help you throughout the case. We’ll be available throughout to answer any questions and to provide free legal advice should you need it. Call us today on 0161 696 9685 and speak to one of our advisers directly. Send an email to claims@advice.co.uk with details of your claim and we’ll call you back at a convenient time. Fill in this online form and we’ll start your claim. Advice.co.uk are personal injury specialists and can help with fatal accident claims anywhere in the UK. We only work with solicitors who offer no win no fee services so you can be sure you’re not going to end up with a large legal bill if your claim fails. When you contact us, we’ll start by offering a free initial consultation to assess your claim and provide you with honest advice about whether you have a good chance of successfully being awarded compensation. What to do after a death – a really useful guide from Citizens Advice about the practical steps you need to take following the death of a family member. Citizens Advice Clinical Negligence Claims – Further advice from the Citizens Advice about when to take action against the NHS for medical negligence. Bereavement Guide – A guide from the charity MIND, about the effects of bereavement and the effects it has on us.